This warm and charming apartment is located, together with three others, on a large estate with two fully restored houses. The apartment is tastefully furnished and finished with distinctive details. The estate, of approximately 40 hectares, hosts a lake, enclosed by woodlands, which is great for fishing, and an example of Roman period architecture. Along with the occupants of the other apartments, you'll have access to a large swimming pool with children's pool, an outdoor shower, a playground, a small playing field, and a pergola with seating. The apartment is situated just 3 kilometers from the village of Foiano della Chiana, where you can do your daily shopping, have a nice meal, and find the train station. Cortona, about 20 km away, is really worth a visit. This town sits atop a hill and is one of the oldest cities in Italy -- it is truly stunning. For shopaholics, there are outlet stores in Foiano della Chiana, 9 kilometers from the house. Lake Trasimeno is 25 km away and is absolutely worth a visit. Additionally, cities like Arezzo (30 km), Siena (50 km), and Perugia (65 km) are highly recommended for a fun day out. 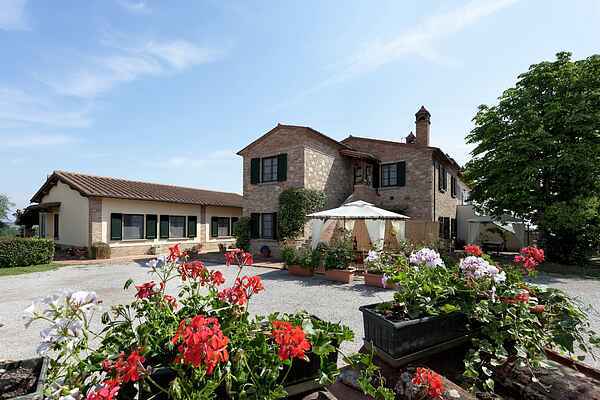 Agriturismo Cisternella is situated in absolute tranquility of the hilly countryside of Tuscany. Its strategic position make easy to reach in a short time some of the most important art cities in the center of Italy (Arezzo, Siena, Perugia, Cortona, Pienza, Montepulciano and Florence), the Trasimeno lake (Castiglione del Lago and the Maggiore island little known but very charming) and also the sea of the Tyrrhenian coast is an hour and a half drive. For those who want to shop, we recommend the Outlet Village Valdichiana (with more than eighty shops) in 5 min drive, and at about 40 km the outlets "The mall" and "Space". Every Monday, in the streets of the center of Foiano della Chiana take place the weekly market, where over purchases of all kinds can enjoy typical products of the place. Moreover, in the local museum and in some churches it is possible to admire the sculptures from Della Robbia family realized in the Renaissance period. During your stay at the Agriturismo, the owner are pleased to offer to its guests a selection of products made with ancient grains flour grown and produced by the same farm (products that may be purchased on site).